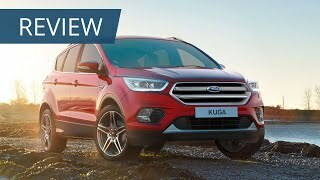 Ford aimed to diversify its lineup and brought elegant model Ford Kuga 2017 to fascinate the competitive market. This model doesn’t sport the present generation design language, as we see in the Ford Ecosport, Ford Figo hatchback or Ford Figo Aspire. It is a better model for those who want more versatility, convenience, and better seating position. 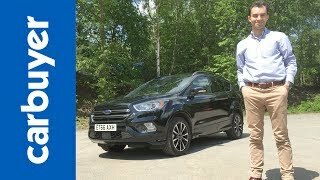 Let us have a close look at the review of model Ford Kuga 2017 and get to know better about the handsome model. The interior of Ford Kuga 2017 is very impressive and stylish. The steering wheel boasts several control buttons. In front of the steering wheel dual pod driver information panel is visible along with a digital screen. At the centre console there is touchscreen infotainment system and below it the centre instrument panel is the home for several control buttons. In addition there is a pretty gear shifter stick which looks stylish with the chrome garnishing and behind it there are two cup holders which can be seen from the middle of the two front seats. The steering wheel, seats are wrapped with plush leather. The interior also looks stylish because of the panoramic sunroof. The cabin is quite spacious with pretty much head space, leg space and knee space. In all, the Ford Kuga 2017 is a complete standardized package. The exterior of Ford Kuga 2017 is nonetheless. The front profile comes with a sleek HID headlamps get LED daytime running lamp units integrated to them. The front grille has sports dual sleek chrome lining with the Ford logo at the centre. The front bumper looks huge, with the lower air intakes almost filling up the space. The lower air intake boasts three horizontal slats. At the lower bumper fog lamps can be seen at both sides. They are not in conventional round shape, but wide and LED integrated. There is a scuff plate at the front bottom which gives the model a true crossover look. There is a panoramic sunroof with two roof rails. The rear profile gets Ford Ecosport like rear window. At the rear end two angular shaped taillamps can be seen and at the rear bottom a silver coloured diffuser is visible which houses twin round shaped chrome tipped exhaust vents. 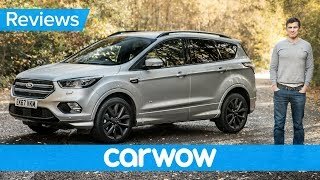 All these features boast the Ford Kuga 2017 with amazing look. Ford Kuga 2017 comes powered with 1.5 litre EcoBoost petrol engines and a 2.0 litre Duratorq diesel engine options. The 1.5 litre engine variant is available paired with both 6 speed manual and 6 speed automatic gearboxes. The manual variant offers the 147hp of power and 240nm of torque and the automatic variant offers 177hp of power and 240 nm of peak torque. The 2.0 litre TDCi Duratorq diesel engine mated to a 6 speed manual transmission churns out 147hp peak power and 370 Nm peak torque. There is another variant of 2.0 litre diesel engine with different tuning, which produces 177 hp peak power. 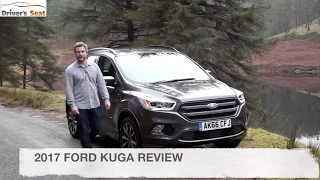 In all, Ford Kuga 2017 serves as a powerful model.